There are countless conditions that a heavy blanket could be beneficial for, including ADHD. And I’m sure you’re wondering how it all works, so let me put my science hat on and explain. Attention Deficit and Hyperactivity Disorder((http://www.chadd.org/Understanding-ADHD/About-ADHD.aspx)) is a chronic neurodevelopmental disorder mainly affecting children but can continue into maturity. The exact cause of ADHD is still unknown by medical experts, but environmental factors could have an influence. Brain injuries, exposure to lead and chemical insecticides during infancy and childhood, or premature birth and underweight births will definitely increase chances of having ADHD. ADHD negatively influences focus and self-control and impacts the daily management skills a person needs to organize and get through the day. It’s not mainly a behavioral issue but is caused due to a problem in how the brain unfolds its management system. For example, a person without ADHD would wake up and have their day mapped out, you know you’re going to get up, go to the loo, brush your teeth, take a shower, get dressed, pack your lunch, get into the car, drive to work and so on. But for a person with ADHD that process, that chain of events, is completely muddled in their mind and they find it difficult to organize a step-by-step formula. This can cause a lot of frustration for someone with ADHD, as they aren’t able to keep up in this way at a regular level. ADHD is a condition that has a genetic predisposition and can therefore be handed down from generation to generation. You’ll find that most ADHD sufferers will have a parent who has it too. ADHD however, is easily misdiagnosed, or mistaken for other conditions. It is also sometimes confused with ADD or attention deficit disorder without hyperactivity. This is the cognitive and social behavioral issues without the inabilities to sit still, the anger, anxiety and so on. The symptoms that ADHD((https://www.understood.org/en/learning-attention-issues/child-learning-disabilities/add-adhd/understanding-adhd)) sufferers are prone to, can be quite socially awkward and alienating. If you have a loved one that suffers from this condition, you will want to put your patience cap on, because it’s as difficult for them to deal with, as it is to you, and you will absolutely need to be very understanding. The main treatment for ADHD is medication with calming effects. There would also be medications to stabilize moods, stimulate cognitive function, memory, and of course, reduce hyperactivity. Although I will say that I’m not sure what the long-term effects of these medications might be. Acupuncture to support and open energy meridians that will regulate the body’s natural chemical balance. Cognitive behavioral therapy or anger management. Activities like swimming, running, horse riding, or even the responsibility of taking care of a pet (with regular supervision of course). Sports that teach discipline and self-control like martial arts, kickboxing, wrestling, gymnastics, ballet and so on. Following a healthy diet. I’m going to harp on this subject for a moment, as research has shown that certain chemicals in the food we eat have a significant impact on people with ADHD, especially children. Additives, preservatives, sugars, high-fructose corn syrup, colorants, refined white flour and artificial sweeteners are extremely harmful particularly in someone with ADHD. These ingredients will put ADHD symptoms into overdrive, severely impacting the person’s capability to function at a standard rate.Therefore, drinking clean water and eating well-balanced, organic and nutritious food, will greatly improve your body’s natural ability to heal and regulate itself. Full body hands-on massage. Provides an overall sense of wellbeing. Deep Pressure Touch (DPT) Therapy. This treatment focusses on pressure points in the body that help relieve stress and anxiety. Applying pressure to those points will also release toxins and acids that have built up in muscle fibers, aiding in general relaxation.It’s known that people have resorted to all kinds of home remedies that provide a pressure-like feeling, such as lying under books, pressing against the temples, or using multiple blankets on top of them to get the same effects as DPT Therapy. But there are better ways to go about this. And I’ll uncover that in a moment. And there it is: the weighted blanket. Heavy blankets are designed to apply pressure on the user in a similar way to deep pressure touch therapy. 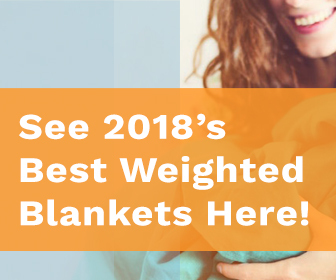 This blanket helps your body release feel-good hormones, and decrease stress and anxiety, which release cortisol into the system, all of this allows your body to deeply relax. It also provides a sense of comfort and safety that ADHD sufferers so dearly need. Weighted therapy can be used in the classroom in the form of a lap pad or shoulder pad to increase mood and provide a sense of security and calm. That alone will help your child focus on the important work at hand for longer periods of time. Energy transition is commonly defined as a continuing structural alteration in energy systems, therefore you can conclude that the energy conversion organs and receptors in the body do not function at a normal rate in a person with ADHD. You’ll have much more intense levels of energy, which causes the constant need to move. Hence, you are hyper (over) active. This increase in energy can also make you very tense which can lead to muscle spasms and tension headaches, and it will certainly make it difficult to wind down at the end of the day. People with ADHD tend not to sleep well. The confusion of the day, and the inability to organize thoughts, prevents the brain from resting and allowing for a good night’s sleep. The weight of a heavy blanket however, can help solve this problem due to the relaxing and calming effects I spoke about earlier. The pressure applied via the blanket will gently push you into your mattress and provide a sense of comfort that will help lull you to sleep. It’s clear that with irritability, hyperactivity and fidgeting, comes the incapability of sitting still for long periods of time. Children with ADHD need constant stimulation, therefore sitting down in a motionless position for too long completely goes against nature, and will have your child irritated and dying to move in no time. The use of a weighted lap pad, or blanket if you are at home, will greatly improve that as it makes you or your child more comfortable with your surroundings, and allows for the ability to deal with anxiety more effectively. In conclusion, ADHD symptoms can be managed and greatly improved through the use of a heavy blanket, quilt or duvet.